Kiwi Nurseries Ltd. and Kiwi Landscaping (1983) Ltd. employ over 15 local employees each season and are always looking for great staff to join our team! Our work environment is always evolving and being updated with the changing times. To keep up with growing client demand, we are seeking dedicated, self-motivated, and friendly people wanting to expand their knowledge of horticulture. If you love being outdoors, keeping fit, and providing outstanding customer service, then we would love to meet you. We pride ourselves on having excellent customer service at competitive prices, as well as great quality products. We want our clients to come back time and time again for the service and knowledge that they gain by buying from us. It does not matter if you have been gardening for years or have limited experience, we offer training in all areas. 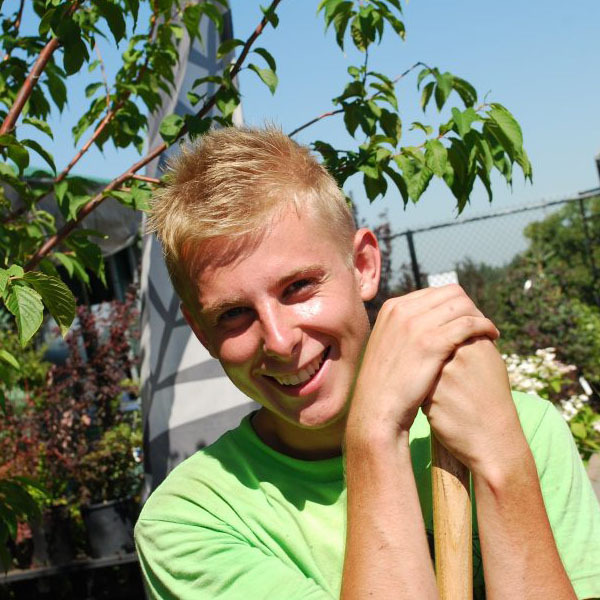 If horticulture is a career path that interests you, we do offer apprenticeships for the landscape gardening program. For more information on what a day in the life of a Landscape Gardener looks like please view Alis Occupational Video for Landscape Gardener. If you believe you may be a good fit for our company, please send us your Application to [email protected]. Description : Full-Time, Seasonal. Customer Service, Sales, Laborer. Are you over 18 and enjoy working hard, being outside, staying active, and providing excellent customer service? Come join our Retail Nursery Sales team for the 2018 season! There are many roles available in the retail yard, depending on your skills and interests. From helping clients in selecting trees, shrubs and perennials for the right location, and answering their questions about plant care and planting, to receiving, unloading, moving and maintaining stock, pulling orders, creating invoices, and completing transactions. This is a fast-paced and at times physically demanding job. There is never a dull moment, as we are always growing, bringing in new stock, and learning new things. We work as a team, helping each other out with daily tasks, and working hard to keep our customers satisfied. As a seasonal business, this position will start prior to the Nursery opening to the public and will involve several weeks of preparation for the season, including: Potting up plants, inventory, organizing, general labour, unloading plants, tagging plants, cleaning etc. This is an active job which requires the ability to work outdoors in a variety of weather conditions. We do not work in the pouring rain, but do work in mud, wind, light showers and on hot summer days. If you think this is the high paced job you are looking for, please send us your Application to [email protected]. There is no public transportation to our location. Description : Full-Time, Seasonal. Driving, Laborer, Customer Service. Are you over 18 and enjoy physical work, with a chance to interact with the public and help their landscaping plans come to life? We want you on our team starting in Spring 2018! We are looking for organized, energetic, efficient and personable individuals to complete retail deliveries and plantings for plant material purchased from our retail yard, and complete all applicable paperwork. You may also find yourself completing various labour tasks around the Retail Nursery, Tree Farm, or even planting on and maintaining past commercial sites, as required. Your ability to “go with the flow”, pick up new skills quickly, and take direction will help you succeed in this role. This is a physical job which requires strength (must be able to lift and move up to 50lb without assistance), and the ability to work outdoors in a variety of weather conditions. We do not work in the pouring rain, but do work in wind, light showers and on hot summer days. We provide training on how to use the proper tools and machinery to complete the job. Are you looking for a physically active job, which allows you to work with plants and a variety of tools and equipment? Kiwi Landscaping is looking for seasonal Tree Nursery Labourers to join our team to assist in a variety of duties on our 200+ acre tree farm. This is a physical job which requires strength (must be able to lift and move up to 50lb without assistance), and the ability to work outdoors in a variety of weather conditions. We do not work in the pouring rain, but do work in wind, light showers and on hot summer days. We work Monday to Saturday, between 8:00 am and 6:00 pm. If you think this is the high paced job you are looking for, please send us your Application to [email protected]. There is no public transportation to our location. Shared accommodation is available.